Researchers at the Department of Energy's Oak Ridge National Laboratory have developed a new method to manipulate a wide range of materials and their behavior using only a handful of helium ions. The team's technique, published in Physical Review Letters, advances the understanding and use of complex oxide materials that boast unusual properties such as superconductivity and colossal magnetoresistance but are notoriously difficult to control. For the first time, ORNL researchers have discovered a simple way to control the elongation of a crystalline material along a single direction without changing the length along the other directions or damaging the crystalline structure. 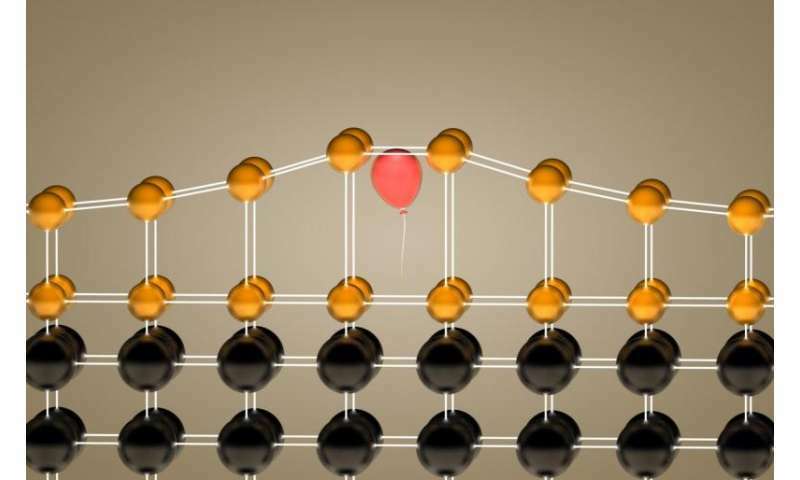 This is accomplished by adding a few helium ions into a complex oxide material and provides a never before possible level of control over magnetic and electronic properties. "By putting a little helium into the material, we're able to control strain along a single axis," said ORNL's Zac Ward, who led the team's study. "This type of control wasn't possible before, and it allows you to tune material properties with a finesse that we haven't previously had access to." The intricate way in which electrons are bound inside complex oxides means that any strain—stretching, pulling or pushing of the structure—triggers changes in many different electronic properties. This ripple effect complicates scientists' ability to study or make use of the finicky materials. The researchers demonstrated the technique on a common oxide material known as LSMO but they anticipate the technique will be widely applicable to both functionality driven materials science research and fundamental physics studies. "Complex oxides are where we expect an immediate impact, but this technique should be an important new tool to use on any material where crystal symmetry affects functionality," Ward said. The team's work is a step toward bringing complex materials into commercial applications, which would greatly benefit from the ability to tune material properties with processing similar to current semiconductor technologies. "Our strain doping technique demonstrates a path to achieving this need, as it can be implemented using established ion implantation infrastructure in the semiconductor industry," Ward said. The method uses a low-energy ion gun to add small numbers of helium ions into the material after it has been produced. The process is also reversible; the helium can be removed by heating the material to high temperatures in vacuum. Previously developed strain tuning methods modify all directions in a material and cannot be altered or reversed afterwards. "We can easily control the amount of strain and how deep that strain is inside the material," Ward said. "By controlling the number of helium atoms inserted into an epitaxial film, we select a strain state in one direction while the other two directions are held in place by the substrate." The team's experimental technique will also benefit theoretical research that seeks to model complex materials to predict and understand their behavior. "The complexity of these materials requires a huge equation to explain their behaviors," Ward said. "Normal strain tuning methods require you to change many variables in that equation which means that you don't really know which one is giving you a specific reaction. In our case, there's one variable. You can feed in a single term and try to break through that complexity a little bit by simplifying it. This is a great method to experimentally probe theoretical models."